From the Queen of Scream comes a novel that will raise the hair on the back of your neck. To the neighbors, they’re sweet old ladies. To Tim Robertson, they’re his worst nightmare. Not every grandmotherly type bakes cookies. What’s more frightening than finding out that the kindly old ladies living across the street from you are anything but? As a child, Tim Robertson is selling cookies with his best friend Damien when they knock on the door of the house across the street from him. Two old ladies open the door and Tim never sees his best friend again. Twenty years later, Tim has tried to move on and forget what happened back then. He is married, has a son, and just bought the house of his dreams in small town Cocoa Beach. When the house across the street from them is sold, they are all looking forward to getting new neighbors, until Tim realizes the old ladies are back to haunt him and the rest of the town. 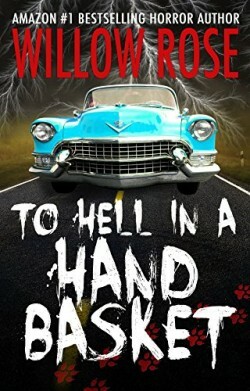 To Hell in a Handbasket is Willow Rose, when she is at her most horrifying. Every page of this book is oozing with dread, and this novel stands shoulder to shoulder with the very best of Koontz and King. Anyone who has read a Willow Rose book knows it’s harder to put the book down than to just finish it.